As I sat holding my frightened 5 year old daughter in the back of an ambulance at 2:30 in the morning, for a split second, in the midst of fear and exhaustion, I wondered how exactly did we get here? Here I was giving details of my daughter calmly to a stranger in a green uniform when all my body craved was sleep. I would say adrenalin was taking over, but medically this is impossible as I live with a potentially life threatening condition which means my body does not produce stress hormones. Moments earlier I had been lying in my bed praying silent prayers. It seemed at that moment they were not to be answered. Naomi had been struggling for the last 24 hours with nose bleeds. At the tender age of 5 she had experienced them before. But nothing on this scale. I had already been in to her 4 times since she had been put to bed. But they just kept restarting. It was getting scary, for her and for me, and for my husband. Dad was becoming frustrated that his baby girl was not able to let him help. So he let me deal with this one. But this one was never ending. And then she started vomiting up blood. Again and again. I have never been so terrified. So I called for an ambulance. So that was how we ended up at accident and emergency in the middle of the night with one of my babies. As I look in the mirror at the scratches and bruises on my neck caused by my five year old non verbal son I once again wonder, how did we get here? How did we get to the place where he punches us, kicks us, bites us, scratches us and throws things at us? When did it all start? When did I start dreading reading his home/school diary because his behaviour has become so challenging? Sometimes things just gradually creep up over time until you realise it has become overwhelming. One unpaid bill soon leads to another, one moment of shouting at your children soon becomes the norm, one day giving in to their food fads leads to constant demands for chocolate for breakfast. 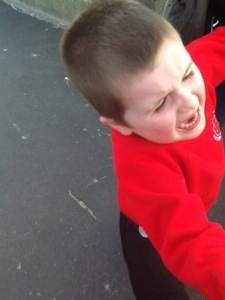 One day Isaac having one tantrum and finding it funny to kick something has lead to him repeating this behaviour often. One reaction from someone, negative or positive, has lead to challenging behaviours becoming a daily occurrence. One day having mashed potato for dinner leads to constant demands for the same food to be repeated. Then one day we had no mashed potato left. 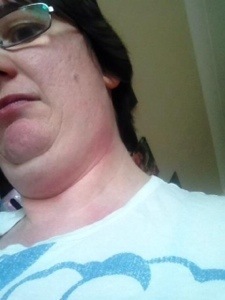 So that was how I ended up with bruises and scratches on my neck from my five year old autistic son. As I find myself in yet another meeting with professionals discussing my daughters personal needs regarding going to the toilet I once again wonder to myself, how exactly did we get here? With only 7 weeks left until she finishes nursery and only 4 months until she starts school, yet here we are talking with a group of professionals about strategies that might help her come out of nappies. 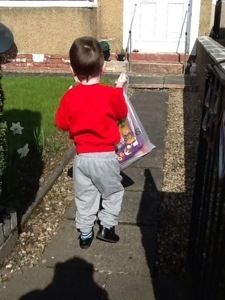 Did I ever think I would have 5 year old children still wearing nappies day and night? No. Did I ever think I would need professional help to potty train a child? No. Did I expect both my children to have additional needs? Not at all. She seemed so perfect at birth. And later on I just thought she was slow to walk. In fact, I had very few concerns about my little princess until she started nursery school at 2 and a half. It was quite a shock to realise that my beautiful blue eyed girl had autism, and with it bowel and bladder issues, high anxiety and gross movement difficulties. It is funny how you soon adjust to talking about your child to professionals like it is a daily occurrence. In fact, for me, it pretty much is a daily occurrence now. You get used to the paperwork, and the forms and constant phone calls. You even refer to some people on first name terms like you have known them since school. You learn to ignore some of their ideas, you learn to adapt other suggestions and you know who to chase up for the missing paperwork. You learn the talk and the lingo and the laws you need to quote. And even though it breaks your heart, you learn to call and order nappies for your school aged child because you know you are still going to need them. You’re on to the fourth attempt at potty training now and you know it is going to be, like everything else, a long journey ahead. So that is how I am still discussing pants and toilet cards and reward charts for potty training my 5 year old. How did we get here? 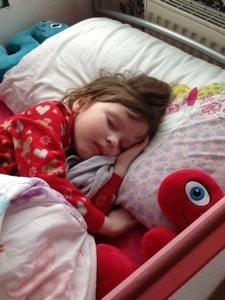 I still ask that every time we visit yet another hospital, or visit the dentist or eye clinic as we do every six weeks, or when we now add in the ENT referral for Naomi. If the NHS did reward cards like MacDonalds do for their hot drinks I would be high on caffeine by now. It feels like we have our own parking space at the clinics these days. Life happens. Sometimes it can feel overwhelming. Sometimes it is relentless. Sometimes you just find yourself in a place you never dreamt you would be. But it is ok. If someone had told me I would have been in any of these places this week when I first gave birth to my beautiful twins in 2008 I would have struggled to believe you. It is a journey. We cope with today, look to the future, pray, hope and keep on going. One day soon I will be back on the mountaintop celebrating with my children in some new amazing thing they have achieved. And I will enjoy it all the more for having been through these valleys. And you know what, even in the great times I will still wonder, how did we get here? How? Because through it ALL God is there. That is how I got here and that is how I will get out of here too. Though you have just this minute screamed so loud in my ear that my entire head is ringing. I still love you. Though you have laid on the floor hitting your head in anger and frustration, throwing everything in sight about, I still love you. When you bang the table and spin your dinner plate in annoyance because I am not cooking your dinner fast enough, I still love you. When I lifted you to safety because you were about to walk head first into the corner of the kitchen work top and you rewarded me by biting me. Even in that moment, when the pain went right through me, I never stopped loving you. When you wake me up screaming and making noise in the smallest of the small hours through the night and I find myself getting frustrated and exhausted. When I roll you over, whisper in your ear quietly and give you your dummy once again because I know you need to try and sleep. Even in the middle of the night I’m still here. And I love you. I love you in all your pain, in all your frustrations, in all your laughter and in all your flapping and chest beating. I love your quirky ways and sense of humour. Even when it seemed, during the 276 days you solidly and religiously only wore your school jumper every day (yes even on Christmas day) I was sighing inwardly. I love how you thought it so funny to wear a blue top, just like that, after so long, only to go right back to only wearing that same red jumper again every single day. Even when I could cry, or I walk away to gather my patience once again. Even when I put you on the naughty step or take you to your room, even when I tell you ‘finished’ and ‘no’, even when it seems like I am the last person you feel cares, right then, I’m still here. And I still love you. When you stamp your feet at me, shout at me and demand of me, and I tell you off for being rude or cheeky. Right there, at that moment when you want to walk right away from me and never talk to me again, right at that precise moment, I still love you. When you play with your toys and accidentally smash my favourite mug, or spill hot tea everywhere, or pull the toy right at the bottom of the pile knocking boxes of various things flying across the room. When my mouth says ‘stop that right now’ or ‘that’s it’ or ‘I’ve had enough’, my heart is still full of love even when my emotions get the better of me. When you wake up in the middle of the night from a scary dream and you call out my name. It doesn’t matter if I am not right there in your room. I am still here, and I still love you. 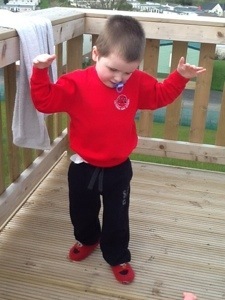 When things are tough at nursery, when you just can’t seem to speak or work through your anxieties, when your one and only friend is not in that day and your heart sinks, I might not be holding your hand, but I am right there. When the dentist visits again and you instantly have flashbacks to the trauma of having your teeth coated with fluoride and how the very taste made you vomit because you could not bring yourself to spit out the excess stuff, I am right there. I have gone before you and prepared a way out. When I know it will just be too much for you I ticked that box that said ‘I do not wish my child to take part’. Because I love you. And I know how much you can bare. When I ask you to be quiet in full conversation because the phone just rang and you get frustrated because you didn’t get to finish what you wanted to say, when I push you to try on pants again when you would rather stay in nappies, when I get you to try and dress yourself when you would prefer I did it for you, it is all because I care. When you are struggling to pull those trousers and pants up when you have just sat in the toilet and you feel I have left you alone in your embarrassment and shame, I haven’t. I am watching, praying, pushing, stretching you and helping. I’m still here. And I love you. In the tears and the frustrations, in the moments you want to be alone, in the moments you are afraid or worried, in the moments of excitement and laughter, in all of those and more, I’m still here. When the silence isn’t because we are a peace but rather because words have got lost in the stress of another long day. When you are leaving out one door as I am coming in from the other. When you can’t see any joy in the week through the stream of appointments and commitments. When the sum total of our kisses seem to be a quick peck on the cheek. When night and day become a non stop blur that never seems to end and intimacy is pulling the duvet closer around you. When the flame of love is a spark barely still flickering. When you have tripped over one stray toy too many, heard the same clip of dvd so often you are tempted to see if the dvd can be fried for lunch one day, and there is no longer any laughter at the dinner table. When you are still clearing away the dishes from the previous meal whilst I am cooking the next one. When you drive the car to get groceries and you are temped to sit in the car park for half an hour before going in just to get time on your own. When you have a head ache that has gone on so long you start to forget what it is like to no longer have one. When the only hand you hold is a young child’s to help them down the stairs when once you used to hold hands with your best friend and lover. When you dread the school holidays because you just don’t know what to do with the kids anymore. When your child wants pushed on the swing for so long you start to lose feeling in your arm and your chin is growing a beard while you stand there. When it seems hope is lost, the clouds will never move and the hill will never be conquered. In all those times I am still there. Still praying. Still holding on. Still loving you. We will get through this. When you have given up on me. When you think all is lost. When hope seems a distant memory. When you sit in the middle of the floor when the children have gone to bed and the tears won’t stop. When your heart aches just to be close to someone. When you think you just can’t face another day…don’t despair my child. I know it is hard. I know some days you just feel so alone. But I need you to remember something, my precious one: I’m still here. And I still love you. Is it time to return to routine yet? They don’t do lie in’s, my children. They don’t do early nights either for that matter. 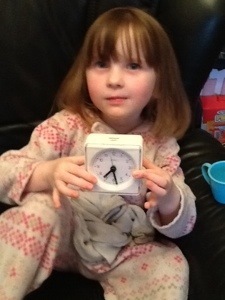 And my 5 year old number fixated daughter has just discovered a little alarm clock. In true autism style it has become the latest thing to be carried everywhere. And thus we must be informed of the time at every opportunity. Except she can’t tell the time yet so the results are funny, cute but incredibly annoying all at once. Does the speaking clock require a stand in for a day or two? Sigh. I guess I should be happy she wants food when she is such a fussy eater. Chocolate spread sandwich it is again. Oh to try cereal just once. Strange that. Always seems to be numberjack time. Maybe I should change the battery in that clock sometime. Oh yes, that means shower time for mummy. Quick check that twin brother is settled on google earth travelling into oncoming traffic on the motorway and mummy is out the room. And breathe. Surely one has to be safe in the bathroom…. Was that a little voice I heard over the noise of the running water? So towel tied around me, hair dripping, and glasses still on the bathroom windowsill, this is what I face in my return downstairs. I used to take my time dressing, choosing clothes, drying my hair, even stopping to check myself in the mirror. Now I break world records getting ready only checking the mirror to make sure I didn’t accidentally put talc in my hair instead of shampoo. While dad has returned from hanging out washing in the garden (I am sure this is just an excuse to escape) and little miss talking clock is happy resuming her watching of numberjacks, I check the fridge to make sure nothing got eaten by Isaac in his search for mashed potato, and make him a drink and snack while I am at it. It really will only be a matter of time before he once again screams for that illusive mashed potato. So I offer mr lift door watcher a biscuit. 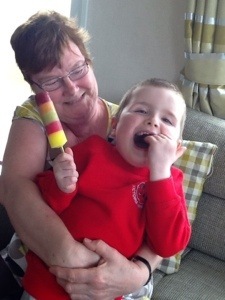 Aghhh, how could mrs asd super-mummy not have known that all said biscuits were indeed broken. Cue meltdown once again. Time for escape plan A. Trip to the shop. Who cares what time that little clock says this mummy needs a cup of something full of caffeine and we are either buying the shop out of mashed potato or biscuits…but we are NOT buying anything, I repeat anything, number related! At least the boy won’t bleed my ears in the car other than with screaming. And then he did it. Maybe he wanted out from the constant number and time talking. Maybe he realised this mummy was on a mission. Maybe he actually understood he was getting biscuits. Either way he was just utterly amazing. Walking right through his beloved automatic doors, right to the biscuit aisle, picked up some biscuits and then went to the checkout to pay. Actually if only I could pause time right now. Because this was something incredible. My non verbal, global delayed, classically autistic son just held my hand and walked into a supermarket with me to buy biscuits. He even put them in a bag and walked back to the car with me. And carried them into the house. Too late, the boy had eaten three biscuits by then anyway. Actually just talk to Naomi about that one. She’ll tell you what number on the clock they all came at, left at and everything else in between. I love my children. I love being a mummy. But is it time to return to routine yet? We all experience emotions all the time. And children with autism are no different. But where we can usually calm ourselves down when angry, understand the need to slow ourselves down and end a game rather than becoming hyper or even soothe ourselves when sad, this is an area where people with autism can so often struggle. They find regulating emotions so difficult and can often swing from one extreme emotion to the other very quickly leaving everyone around them puzzled and confused. 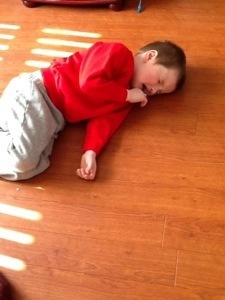 This week I have seen this become an every day reality in my non verbal son. We have been on holiday this week in a caravan. No matter how hard we try, his routine has had to change. 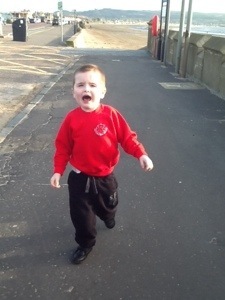 There is no school on holiday and at times this has been a massive challenge for him. He has used the iPad to show me pictures he has found of anything school related in an attempt to question why he isn’t going there. 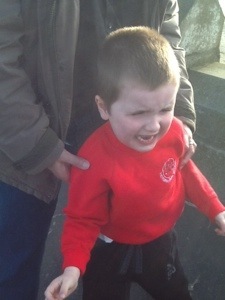 This is not helped at all by the fact the only thing he will ever let us dress him in is his beloved school uniform. He doesn’t ‘do’ holidays. He ‘does’ school. So even in a caravan 50 miles from home he has still been looking for his school taxi and pointing to any similar looking car we pass and screaming. Every day has been like walking on a tightrope. He doesn’t ‘do’ wind down and chill. He does ‘get up and go’ from the second his eyes open to the second the melatonin finally kicks in and he drops off for a little sleep. 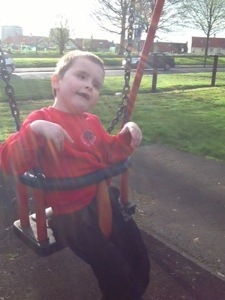 And for a non verbal child he can be extremely demanding and loud. Internet is limited where we are. And boy has he let us know how this has frustrated him. His favourite interests on the iPad are you tube videos of lift doors opening and closing over and over again, and google maps. And he has been most unimpressed that you tube and google do not work as he expects them to. You can’t explain terms like signal or coverage or wifi to him. All he knows is he presses the buttons and mum makes them work. So mum is at fault. And he then throws the iPad at me, scratches me, bites me, hits me and screams. Holiday? What holiday? Autism doesn’t take a holiday. So you take him out and keep busy. But this isn’t the swimming pool he normally goes to. So you have to literally drag him screaming through the corridor to the changing rooms because he does not understand that other places can also be swimming pools. And he screams at the look of the different changing rooms. And I start to question if all this is worth it. The moaning, the screaming, the ‘challenging behaviour’ seems endless. But then he gets in the water and immediately changes to the hyper, laughing, splashing, happy boy. Within seconds it was like someone switched my son. From one extreme emotion to the other just like that! And then getting out he switched right back, instantly his body got out that water. The same with soft play. He loves soft play. But nope, this isn’t soft play to him. Because it isn’t one of the ones we normally go to back home. So you pay money to carry in a screaming five year old while everyone looks at you and quickly turns away. If only this child would wear his autism t-shirt at least now and again. But no, he has to wear his school uniform which just somehow makes it all look worse. It must look like I am manhandling a child on some school trip to the seaside. Who would believe we are actually on holiday trying to have some down time? But once in and he realises that this is a soft play, the tears stop, the flapping and chest beating starts again and he giggles like he is the happiest child you ever met. If only the scratches and pinches he gives me could vanish as quick as his tears! Going anywhere in the car this week has seen him in default mode of whine. ‘Uh, uh, uh’ has been on constant play since the minute the car pulled up to the caravan park. It is a dull moan of wanting attention, of saying in his own way that things are not ‘right’ for him, of making it clear he isn’t happy. But the whining barely stops. So you would think this child was hating being in the caravan on holiday. Yet one minute later he is out on the decking flapping, running up and down, laughing hysterically at a dog barking or cow mooing. 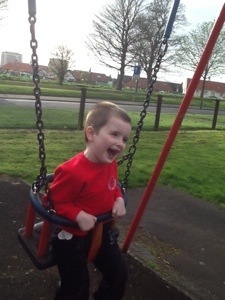 Or waving his arms in complete ecstasy because he is being pushed in a swing. There is no in between just now. So I feel like I am on that swing too. Except it never stops. We have the highs of laughter, hyper ness and flapping and chest beating followed immediately by screaming, moaning, scratching, kicking, pinching and throwing. We have the sheer innocent excitement of seeing the seaside followed immediately by the danger of him running straight out to the sea. Unless he is strapped in a car seat, buggy or swing there is no sitting down. There is no watching a dvd or looking at books, or colouring in like his twin sister. It’s just all about him. It’s all go. It’s exhausting and draining. For everyone of us. In fact I need a holiday to recover from the holiday! Autism doesn’t take a holiday. It is extreme one way and extreme the other. Isaac can’t regulate his emotions. And right now I am struggling too. If you asked me how the holiday was going I would have to answer with ‘sometimes wonderfully, sometimes dreadfully.’ If only there was a happy medium. Now that really would be a holiday! This is for those of you who have not seen this. I was approached by a social media group of parents to do something to mark autism awareness day on 2nd April. Thank you once again to all the families who helped me make this by supplying photos of their beautiful children. Can you spot my own two beauties? It just would’t seem right as a mother of two children with autism to let this day pass without writing in my blog. I had so many plans to write a positive, upbeat blog about how great my kids are, how much autism has taught me and how proud I am of them. Yes that is all true but yet ironically, today of all days, autism has hit me right in the face again. It started off so well with publishing a video on social media that was received well. Both kids got off to nursery and school easily enough and I even got to get a hot cuppa without the phone ringing or the door bell going. Gosh, I even managed a shower! But then my daughter came home from nursery with that look that told me her morning had been a struggle and she was right on the edge of crying. Call it mother’s intuition or whatever you like, but I just knew this was a ‘big one’. This was something that was going to take days or weeks to recover from. And I was right. First thing I noticed was the smell. My poor baby girl had been in a dirty nappy for hours and it hadn’t been noticed. She is in a busy mainstream nursery where she doesn’t speak but complies with requests without question, and is hugely anxious about approaching or interrupting staff. So she would never ever say she needed changed. After being refreshed and fed she told me exactly where she was when she ‘went’ and what she was playing with (she is a girl of detail) and how she looked at a member of staff but they ‘never noticed me’. You see, this is autism. She has no idea, even at 5, that the staff can not read her mind. They can not understand that she needs changed simply by her looking at them. And she did say they never even looked at her back as they were ‘busy like they always are.’ So my baby just carried on with a soiled nappy on hoping someone would notice. It came to snack time. She rarely takes snack but staff are trying to encourage her more. So they succeeded and she sat reluctantly on a chair even though this was uncomfortable. Why? Because the ‘lady told me to sit down’. She was then offered strawberries which she took because she was told to. But she hates strawberries. They make her sick. So she naturally left them on her plate. Staff (who understandably have no knowledge that these make her sick as I forgot to mention it when enrolled her 18 months previously) encouraged her to eat them. So she did. Even though they make her sick. Why ‘because the lady said to eat them.’ Her autism makes her compliant to rules, even if those rules mean she will be in pain and discomfort. She has to obey. That is the rules. That is what you do. At circle time she went to the carpet. By now she was sore and very reluctant to sit down. So she stood and looked at a member of staff. A silent plea for help. A silent hope that they could read her mind. They told her to sit down. So, despite the pain this caused, she sat down. ‘It made me sad mummy’. Oh baby, it makes mummy sad to hear this too. She then sat on a bus for 45 minutes to come home. Still no-one noticed. Until finally she got home and it all came out. And shortly after telling the story she was sick. Then sick again. And again. ‘I ate strawberries mummy and I always get sick when I eat them.’ She knows. But would she do it again? Yes she would. Because she can’t seem to break the rules. If someone tells her to do something she will. She is obedient without question, even to her own pain. 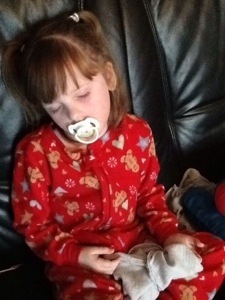 She won’t be back to nursery for weeks now as she will be off sick tomorrow and maybe the next day too. And then the schools are off on holiday. Perfect timing as she never wants to go back. I thought we were getting somewhere. I thought we were getting closer to going to mainstream school. Today reminded me we have such a long way to go yet. I so wanted to be upbeat on this world autism awareness day. But autism doesn’t take a day off. Autism hits you when you least expect it. Autism can still be hard even when you accept it and embrace it head on. This isn’t about the nursery getting it wrong today. Things happen. People are human. 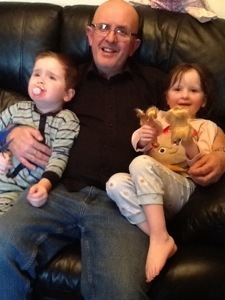 And they can’t be mind readers like my daughter thinks they are. This is about a little girl who is vulnerable, hurting, and confused. This is about a little girl who is now sick. This is about my heart breaking once again. This is autism. On world autism awareness day.